We are delighted to present our 2019 Autumn Portfolio, brings together our highly recommended varieties for Autumn and Spring production, plus stunning New Additions released since you received our 2019 Catalogues. Highlights include stimulating novelties to excite the retail market such as the large-flowered Bellis Bam Bam, superb silver-leafed Cyclamen Metalis, the mouth-watering colour of Trailing Pansy Cool Wave™ Raspberry Swirl and a new solution for creating quick and easy colour combinations...Viola Sorbet™ Totally. Local trialling remains a core activity for us, as we endeavour to innovate and deliver the best genetics to your nursery door. Our onsite trials continue all year round in providing our Product Managers and Plant Breeders the opportunity to develop new varieties and enhance existing lines specifically for the UK market. Our extensive Primrose and Polyanthus range covers everything you might need with outstanding and proven genetics which provide colour from October right through to March. The ranges include straight colours, bicolours, rosebud types, double flowering varieties and eye-catching novelties for premium sales opportunities such as Primrose Sweet 16 and the Double Primrose Belarina™ Candy Frost. The Summer Showcase… you are invited! We really look forward to seeing you at our 2019 Summer Showcase. There promises to be plenty of new varieties for the 2020 season plus what will be one of the most exciting and innovative Trends Colour and Retail Solutions display we have created yet! Please pencil the date in your diary; 15th July - 2nd August 2019, this is an event not to be missed! Start taking advantage of these great features today. If you haven’t registered already, do so right now ... it’s quick, easy and free. 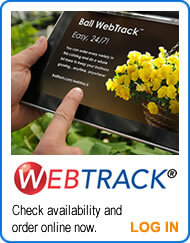 On the right hand side of our website pages is a WebTrack™ panel. Simply click on GO and you will directed through the registration process.